Project webhooks allow you to trigger a URL if for example new code is pushed. You can configure webhooks to listen for specific events like pushes or merge requests. 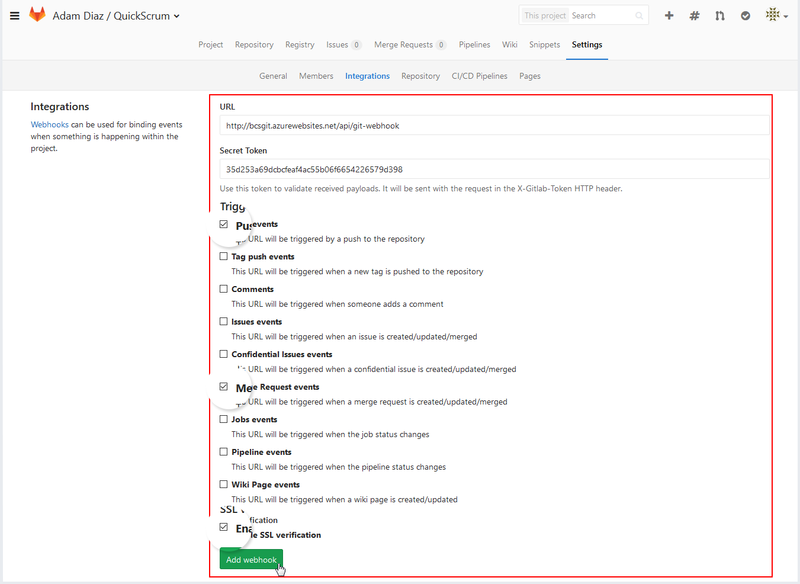 GitLab will send a POST request with data through webhook to specific URL. 1. Go to Action Menu on extreme left of header. 3. Select the project for which you would like to integrate webhook. 4. Click on Settings tab as shown below. 5. Go to the sub header tabs and click on integrations. 7. In Secret Token field enter the below key. 8. By default Push events and Enable SSL Verification would be ticked. Keep them as it is. 9. Additionally tick Merge Request events. So push events, Merge Request events & Enable SSL Verification should be ticked. 10. Click on Add webhook.